One of the biggest challenges when recruiting employees who are the front line of a retail organization is finding quality customer-facing candidates. Most retail environments also have highly decentralized recruiting strategy, with a decentralized budget and managers at the store level responsible for hiring. Jobalign allows your managers to take control of their own job postings and gives your corporate team complete transparency. Our Intelligent Sourcing Engine maximizes a decentralized budget and customizes your budgets by location and job type. Jobalign will automate your job advertising and put your jobs in the right places where retail workers are searching for jobs. 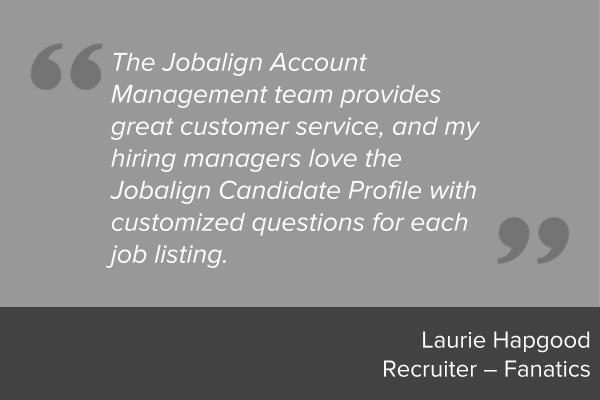 Jobalign makes it easy for you to market your jobs to the best candidates for your positions – your customers! Leverage tools like text-to-apply in-store. The Smart Screening Tool allows job seekers to apply easily from any device, even fully through text message. Pre-screen candidates automatically to focus on the best candidates first. Voice screening questions give you immediate insight into whether a candidate will be engaging for a customer-facing role. Reach candidates through text message, without using your personal phone number. Leverage the Candidate Text Messenger tool to engage candidates immediately and reduce interview no-shows. Managers love that they don’t need to use a personal cell phone to text with candidates and candidates love that you are meeting them on their terms. Retailers partner with Jobalign to drive hourly hiring results.